Great little pieces of Dioptase on matrix from Russia. Each one has a lovely green colour. 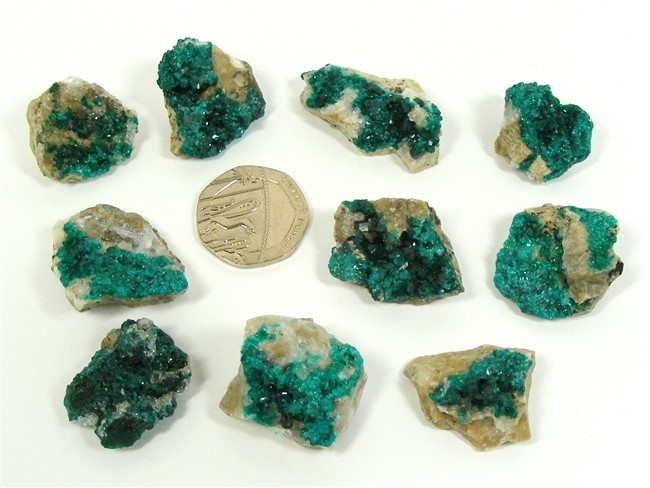 In the past, polished crystals of Dioptase were often called "Russian Emeralds", simply because of the colour. Dioptase is, however, a distinct mineral in its own right and not at all related to Emeralds ! Dioptase has been a long time favourite with crystal healers providing as it does, a feeling of well being and a sense of emotional stability, grounding us when we are floundering around helplessly. Dioptase is a powerful healing crystal. It promotes an overall general feeling of well-being and may be beneficial in relieving the symptoms of Menieres disease and migraine pain. It is also thought to ease high blood pressure, to alleviate pain generally, and to help with heart conditions. Dioptase is a calming and balancing crystal that can bring us emotional stability and can help us to feel good about ourselves and to love ourselves. It helps us to live "in the moment" and encourages a positive attitude to life. It also helps us to develop a sense of self awareness and stimulates our creative imagination. It helps us to overcome addictions and to cope better with stress. Dioptase can easily turn negatives into positives and can provide us with direction when we are floundering around aimlessly. Dioptase is an excellent crystal to help with deep feelings of grief, sorrow and betrayal as it can help in healing heartache and feelings of abandonment. 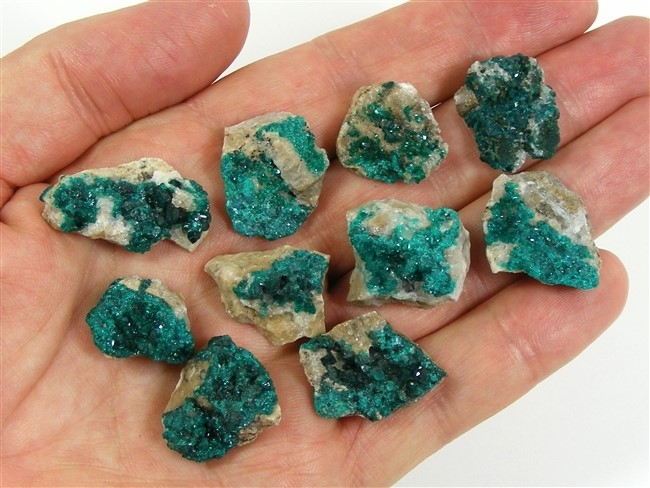 Dioptase has the ability to bring all Chakra points to their highest level of functioning and is particularly useful in helping us to attain spiritual attunement. It helps us to become more aware of our own inner riches and can stimulate psychic vision.